There is never a more special wedding than the son of very close friends! I was incredibly lucky to be a part of their daughter's wedding a few years ago and this time it was their son Michael who I have known since he was 9-years old. He and my son played soccer together and did so all through high school. To say the least this was a very special wedding! Carissa and Michael were together for several years before they got married. Carissa had two beautiful sons that Michael took under his wing, opened his heart to them and has treated as his own. So when they decided to get married the boys would be a very important part of their day. They knew they wanted to get married on Michael's parent's property in Erie, Colorado. So they chose July and hoped it would not be scorching hot! They already had a large barn that was cleared out and cafe lights were hung from the ceiling with ivory pipe and drape surrounding the inside walls to soften the barn and hide the rough spots. A huge tent was placed in front of the barn to extend the indoor area for guest seating. The barn was for dancing! Long tables were strung end to end under the tent with long garlands of greenery down the middle of the tables flanked by pillar candles and votives to create a wonderful ambience. The groom's father built an amazing bar specifically for Michael and Carissa which they totally loved! 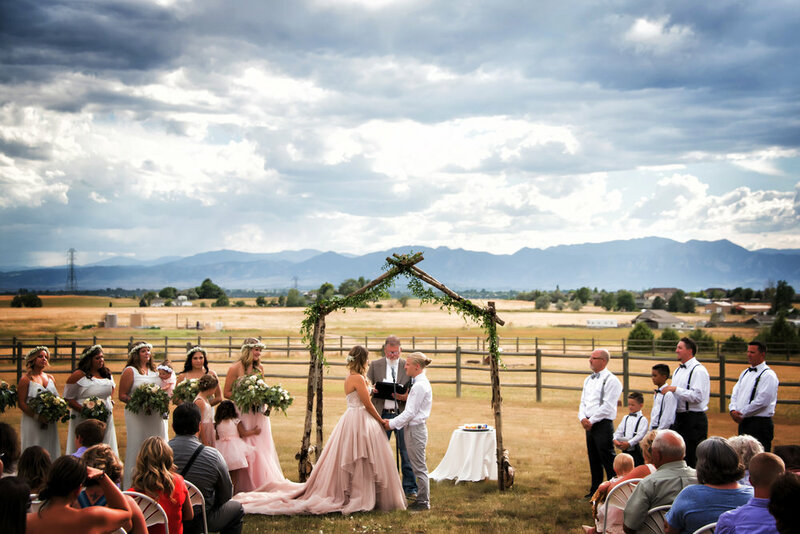 The ceremony was in an open field next to the barn facing spectacular mountain views with a lovely aspen arbor decorated with greenery framing the altar. Michael and Carissa wanted something different for their ceremony so instead of a candle or sand ceremony. They chose a tray of Fireball shots which were brought out at just the right moment and all wedding party took a shot. Now that is different! For dinner everyone had street tacos from a food truck supplied by Comida, which everyone loved! They had a cookie bar with many yummy varieties to choose from!, As a surprise for Michael, Carissa had a cake with the Kansas Jayhawks logo on it as the entire family are AVID Jayhawks fans. Even the fight song was sung! After dinner everyone danced the night away and had a fabulous time!